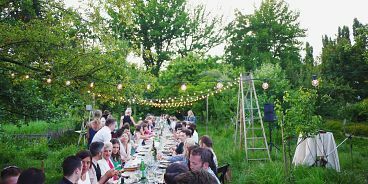 Join us for a special long table dinner on Thursday, August 11th in the Poplar Grove at The UBC Farm. In collaboration with The Juice Truck and Feed Life, we’re creating a true, plant-based ‘Garden of Eden’ meal in honour of Eden Elizabeth to benefit Thrive Alive, a foundation focused on creating access for Canadians to life-enhancing cancer treatments not traditionally covered by the government or most health care plans. We will enjoy an epic 5 COURSE MEAL curated by a chef team that has been hand picked by Colin Medhurst (co-founder of Feedlife and plant-based chef). Your headliner is Chef Karen McAthy of Blue Heron Cheese who will announce her final lineup this week! Your dinner ticket includes wine pairings by Red Rooster, cocktails by Design to Dine, beer and live entertainment. Show up in your Thursdays’ finest (aka: farm chic) and expect the venue to completely blow your farm-to-table, garden of eden dreams out of the water. DRESSCODE Come farm chic. We will be in a fairly open space, please bring an extra layer just in case! PARKING There is a parking lot just off Ross Drive that is the closest one to the event site. Please refer to the map to UBC farm to direct yourself to the parking lots nearby. DIETARY RESTRICTIONS We do our best to ensure all our guests are well taken care of and have their dietary restrictions considered in our meal planning. Please email us with any dietary restrictions or sensitivities, and we will communicate them with our chefs.